It's hard to find food that's instant, delicious and cheap. It's just combinations of two, either instant and cheap but not delicious, instant and delicious but not cheap or delicious and cheap but not really that instant. And I belong to the nocturnal population where we (most of the time) sustain our energy by feeding off 24-hour convenience stores and fast food joints (that sounds very animalandia). Just found these two new budget-friendly meals and let's say they're instant and cheap and pwede na. Hehe. 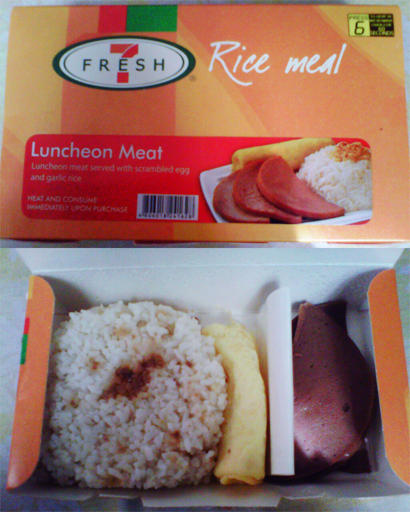 They have this breakfast rice meal in longanisa, tapa (I think), tocino and hotdog, so why the heck not luncheon meat? I've been waiting for them to finally have this, it's about time! This costs 49PhP (the affordable part) and it's pre-cooked so you just have to ask them to heat it for you (the instant part) but the luncheon meat is not Ma Ling and unlike on the packaging where it shows thick slices, the luncheon meat serving is unbelievably thin. I normally order 1-pc Original Chicken meal in KFC because it's my favorite but you have to try something else once in a while. But I was excited to try this because I like KFC's hot shots and fun shots a lot. Haha. I think they replaced the Chicken Steak meal (not really sure) with this. 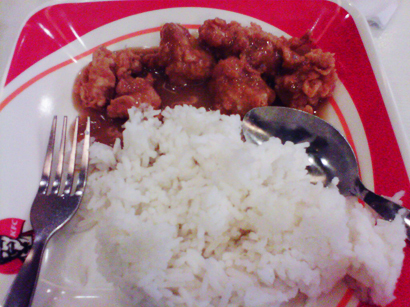 It comes in two variants: Mushroom Gravy and Sweet Chili and costs 50PhP. For them to name it Flavor shots was really ironic because it lacks flavor, and it was just a small piece of chicken meat in so much breading. My friend who tried the Sweet Chili variant said that it tastes like Jufran's sauce. Like I said instant, cheap and pwede na. Hehe. And guess what arrived in the mail today? The Totoro bag I ordered finally came today! I really like it! This is a custom-made carry all tote bag I ordered from Tsoknat Bags! I love the creative packaging! Tsoknat has awesome, quirky and creative collection of bags released once or twice a month and it really sells fast!